The Fidget is ready for flight with a rare, 1975 Orbit threechannel transmitter converted to 2.4 GHz by Jay Mendoza. The Fidget is ready for flight with a rare, 1975 Orbit three channel transmitter converted to 2.4 GHz by Jay Mendoza. 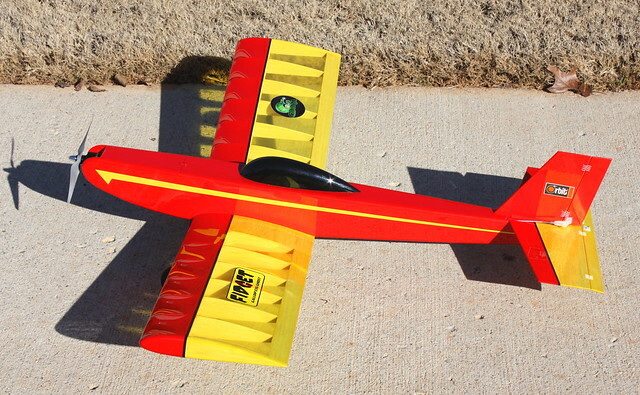 The Fidget is a model specifically designed to fly using a Galloping Ghost RC system. Until now, if you wanted to fly a Galloping Ghost model, you had to either find plans or locate one of the kits that were produced in the 1960s and ’70s, such as the Midwest Lil’ Esquire and Lil’ Tri-Squire, Sterling Mini-Mambo, or Goldberg Junior Falcon and Junior Skylark. Not only are these old kits extremely hard to find, they command high prices. Building a Fidget is considerably less expensive than buying an old, classic kit. It is easy to build, and the Fidget has other advantages as well. Older model designs were originally intended for single-channel, rudder-only control and were essentially Free Flight models with a movable rudder added. 01. The 3/32-inch diameter music wire landing gear is attached to former F2 with Kevlar fishing line and CA glue. Note the hole for the wing dowel and air-cooling holes. 02. The aft side of former F2 shows Kevlar fishing line wraps. Also seen are the 3/32-inch fuselage side doublers where the wing rests on the fuselage. 03. The tail wheel assembly is attached to the 1/16-inch plywood mount using Kevlar fishing line and CA glue. They typically featured flat-bottomed airfoil sections and positive incidence was added to the wing. This resulted in a couple of drawbacks when a Galloping Ghost radio, which added elevator and throttle control, was used. These models could only be trimmed for one airspeed, and when the speed increased, the model tended to balloon or nose up into a climb. With the flat-bottomed airfoil section and positive wing incidence, it was necessary to add down-elevator to prevent the model from climbing in level flight. The Fidget eliminates these issues by using a semisymmetrical airfoil section, 0° wing incidence, and a low-wing configuration. The Fidget does not balloon with airspeed increases, and no motor down-thrust or down-elevator trim is needed. This makes the Fidget easier and more pleasant to fly compared with other older classic designs. The Fidget uses a Cobra 2208/26 1,550 Kv motor, Cobra DL22A ESC, and an APC 6 × 4E propeller powered by a 3S 1,350 LiPo battery. This well-matched power system provides a little power margin when needed, as well as decent flight duration. The battery is easily accessible from a hatch on top of the fuselage, and the wing can be removed with a single nylon screw. The Fidget radio system consists of a Tobe Kallner Galloping Ghost actuator with a Phil Green Peripheral Interface Controller (PIC) added, and a Lemon DSM2 six-channel receiver. For the transmitter, I am using a rare, 1975 vintage Orbit three-channel unit that was converted to 2.4 GHz. If you have read this far, and you weren’t flying RC models in the 1960s, no doubt you are wondering, "What the heck is Galloping Ghost?" I’ll share some history that was put together by Jay Mendoza, who is the go-to person when it comes to Galloping Ghost radio control, vintage Galloping Ghost radio repairs, and vintage Galloping Ghost radio conversions. Galloping Ghost has been around in many forms and names for decades. In the 1950s, it was originally called Two-Tone Pulse Width (TTPW). Later refinements were dubbed Kicking Duck, Mickey Mouse, Simple-Simul, Simple Proportional, Pulse, and Galloping Ghost. The gallop and kick names come from the fact that the airplane’s tail pulses up and down as it responds to the elevator flapping up and down. The rudder and elevator both flap, but they flap equally in each direction at neutral, so the airplane flies straight. The controls would flap approximately four to six times per second at neutral. When you moved the control stick, the corresponding control surface would begin to flap more to one side than the other, causing the airplane to react accordingly. The advantage of this crude system was that it offered proportional control and trim using a single-channel radio. 04. The right wing panel is nearly complete. The 1/16-inch balsa sheeting still needs to be added to the inboard rib bay at the left end of the wing panel. Although it was limited to two flight controls and throttle, pulse proportional was a big advancement over escapements and reeds. These early pulse systems were typically built by hand and required some fairly complex linkages. Making adjustments was tricky at best. By the mid-1960s, digital proportional sets began to become widely available, but were extremely expensive. Galloping Ghost pulse-proportional systems gained popularity as a low-cost alternative. Commercial actuators became available, which made using pushrods with clevises possible, greatly simplifying their installation and adjustments. Many companies offered Galloping Ghost and pulse-proportional systems, with the bulk of them based in the Midwest. Because most of the digital proportional companies were concentrated in Southern California, Galloping Ghost was not as popular on the West Coast. Some of the Galloping Ghost manufacturers included Min-X, Controlaire, Ace R/C, Citizen-Ship, Hallco, Bonitron, F&M, Testors, Sterling, Royal, Airtrol, Rand, Airguide/Go-Act, and Tomasser. Even EK Logictrol had its Digi-Ghost system. By late 1969, the cost of digital proportional sets had come down to the point that Galloping Ghost no longer offered a significant price advantage, which left Ace R/C as the only remaining pulse proportional system manufacturer. Returning to the present, the Tobe Galloping Ghost actuator replicates the original Rand LR-3 (Low pulse Rate 3-function) Galloping Ghost actuator with some improvements and minor differences. The improvement is a lighter, more powerful motor, and a brass gear drive that is more rugged and resists stripping the gears in a crash. Unlike the Rand LR-3, the Tobe only offers two functions: rudder and elevator. Throttle is accomplished by an ESC; with gas power, a throttle servo is used. The improvement is that you have nearly infinite throttle adjustment as opposed to the original Rand LR-3 with only five throttle positions. The Rand LR-3 had a habit of giving full up-elevator when changing throttle, which could lead to a stall while on a landing approach. The Tobe Galloping Ghost actuator eliminates this. The secret behind the pulsing action of the Tobe Galloping Ghost actuator is a specially programmed PIC by Phil Green that uses the elevator and aileron servo signal and re-codes them to replicate the pulsing action of a Galloping Ghost actuator/servo such as the Rand LR-3. A modern spread spectrum transmitter and receiver are used, and because only three channels are required, the remaining channels can be used with servos for more features. Using a modern transmitter, you get the benefits of its features, such as multiple model memories, servo reversing, dual rates, exponential, buddy boxing, and more. 05. The Fidget’s outer wing panels are buttglued to the center panel. The joints are wrapped with 1-inch fiberglass tape applied with CA glue. 06. The hatch lock is made from 1/32-inch plywood and attached with a 4-40 nylon screw to adjust friction. 07. The firewall has 4-40 blind nuts and air-cooling holes. Also shown are the 1/8-inch balsa fuselage nose doublers and upper scrap-balsa fill-ins. All you need to fly the Galloping Ghost is the Tobe Galloping Ghost actuator with the re-coder and driver assembly that faithfully replicates the Galloping Ghost pulsing action. It is compatible with any digital proportional radio currently on the market. For those who want an original Galloping Ghost system, Jay has converted an original Galloping Ghost pulse proportional transmitter to 2.4 GHz and replaced the electronics with micro controllers that have more features and flexibility than the originals did, and they are more reliable. Phil again created the programming to make this possible. Another bonus is that after it is converted, you can also use your original Galloping Ghost transmitter to fly any three-channel airplane by simply binding the receiver to the transmitter. After you convert your original transmitter, you will have a system that is externally identical to the original with the exception of the 2.4 GHz antenna. This is the best of both worlds for a vintage RC enthusiast—the original look with modern reliability. Although it is entirely possible to build these systems as a do-it-yourself project, for those of you who are interested but unable to build homebrew electronics, Jay offers Tobe Galloping Ghost actuators with electronics assembled and tested, and also offers to convert your original transmitter. He can be contacted at jaymen@pacbell.net. If you were flying RC in the 1960s and had a Galloping Ghost system, you might want to give it a try again using a Tobe actuator with a reliable modern radio on 2.4 GHz, or perhaps even have your old transmitter converted to 2.4 GHz. Even if you’ve never heard of Galloping Ghost before now, you might want to give it a try to see what it was like in the early days of RC and gain an appreciation for how far RC technology has come. In my case, Galloping Ghost was unfinished business. I was 17 years old in 1969 when I saved my money and bought a Galloping Ghost radio system. I built a Sig de Havilland Beaver with an Enya .09 engine and installed my Galloping Ghost radio. It was my firstever RC model. Although the radio system worked perfectly on the bench, it quit soon after takeoff. 08. The horizontal stabilizer and fin are glued to the fuselage with 1/8-inch triangular balsa pieces added to the base of the fin. Note the hinge thread holes showing at the left end of the stabilizer. 09. A Tobe Galloping Ghost actuator is attached to a light plywood mounting plate. Note the nylon clevises and 2-56 studs that are glued into carbon-fiber tube pushrods. The Lemon receiver is mounted with Velcro tape. After rebuilding the Beaver several times, I gave up and went back to a rudder-only radio set with a different model. It always bothered me over the years that I never got my Galloping Ghost setup to work, and when I discovered what Jay was doing to encourage people to fly the Galloping Ghost again in this modern era, I wanted to give it a try. I’m happy to say that this time around, my Galloping Ghost setup is working perfectly. Finally, after 48 years, I have success! Get the plans, grab some wood and glue, and let’s get building so you too can fly Galloping Ghost! Click here to build the Fidget.